Understanding a forest by measuring the trees! 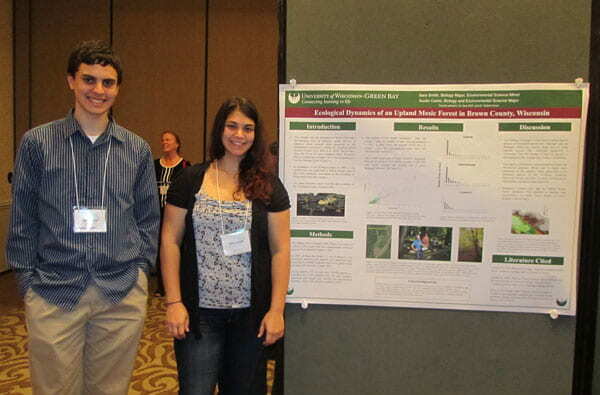 Sara Smith and Austin Carter presented a poster titled “Ecological Dynamics of an Upland Mesic Forest in Brown County, Wisconsin” at the Wisconsin Alliance for Minority Participation (WiscAMP) conference in Madison on October 18, 2012. This annual conference highlights research by WiscAMP student scholars and brings together minority students from throughout the UW system. Sara described her experience at the Madison conference as “Amazing!” She said “It was a bit nerve-racking at first, but I got to meet a lot of very influential and interesting people while I was there. It gave me the opportunity to see what other students are doing across the state, along with an opportunity for networking.” The WiscAMP program provides scholarships to qualified minority students to participate in research in the sciences and mathematics at UW-System universities including UW—Green Bay. Their poster described the results of a summer-long survey of trees in a forest plot on the UW—Green Bay Cofrin Memorial Arboretum. Along with 3 other undergraduates worked through the summer to measure and identify over 2400 trees in a rectangular (60 m x 270 m) 1 hectare plot in Mahon Woods. They also mapped and tagged new trees and documented mortality of trees that had been marked in 2007.The Mahon Plot was established in 2007 as a satellite plot designed to help ecologists at UW—Green Bay and the US Forest Service to prepare for the installation of a 25 hectare plot in located near Wabikon Lake the Nicolet National Forest. Every tree or shrub with a diameter at breast height over 1 cm on the plot was identified to species, measured and tagged. Smith, Austin and the other students re-censused the plot in order to better understand forest ecology. The results of the re-census indicate that the forest has changed over the last 5 years. They found that tree mortality was three times as high as tree establishment indicating that the number of trees in the forest has declined. However, they also found that the total woody biomass and average size of trees increased between 2007 and 2012. So, while the total number of trees the number of trees in the plot is decreasing but the average size of trees is increasing. 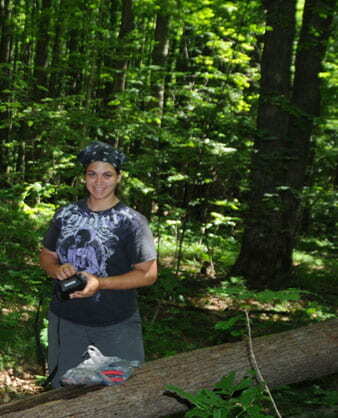 Their findings illustrate that the forest is undergoing the process of ecological succession. Although oaks are dominant today, the relative basal area of shade tolerant species like American basswood is increasing. So why would we want to measure and tag all of the trees in small plot like this? Permanent research sites like the Mahon Woods Forest Dynamics Plot establish a baseline and opportunities for many future studies of forest dynamics and ecology. The scientific value of the site is that it will provide long term data on growth and change of trees in an urban forest. This plot may seem small but its value lies in the fact that it is part of a global network of forest plots managed by the Center for Tropical Forest Science at the Smithsonian Tropical Research Institute. The network includes over forty forest research plots across the Americas, Africa, Asia, and Europe. Sites vary in size from 1-5 hectares for satellite plots to 25-50 hectares for primary plots. Ecologists use identical methodology to census the trees on each plot, regardless of location. This allows data to be compared among sites, even when the forests are separated by 1000s of miles. The goals of this global forest program are to better understand forest ecosystems, monitor the impacts of climate change, and develop long-term strategies of sustainable forest management in a changing global environment. The educational value of the plot is important as well. This campus location allows students at UW—Green Bay to walk right out the back door of the classroom and participate in an important international research project. Students gain valuable field and research skills and also gain insight into possible career paths. Sara Smith said about her research experiences have guided her educational decisions. “I have learned a great deal about myself and my interests. It has solidified my decision in changing one of my majors to Biology with an emphasis in Conservation and Ecology.” Sara plans on continuing her involvement with WiscAMP program next semester by working with NAS professor Dr. Matt Dornbush on a native grassland biofuel project on the Oneida Reservation. Funding forSara and Austin was provided by the Wisconsin Alliance for Minority Participation (WiscAMP). WiscAMP is a consortium of 21 colleges and universities throughout Wisconsin funded by the National Science Foundation in a nation-wide effort to increase the number of underrepresented students achieving undergraduate degrees (and eventually graduate degrees) in science, technology, engineering and mathematics (STEM) disciplines within five years. Austin Carter and Sara Smith with their research poster at the WiscAMP conference in Madison, WI. Students considered to be underrepresented minorities (see No. 3 in the application form) in the science, technology, engineering and mathematics (STEM) disciplines are eligible for scholarships. Projects involving any of the science, technology, engineering and mathematics (STEM) fields normally supported by NSF are eligible. Human biology majors are also welcome to apply. Recipients must be US citizens or permanent residents. Scholarships are available for student scholars and student mentors. Scholars gain valuable research experience and a better understanding of the challenges and rewards of scientific research. Mentors share their academic experience with incoming freshman, sophomore students and others, less experienced, junior and senior students and hold weekly meetings with their mentees and organize activities such as study groups, workshops, etc. Interested students should apply to Dr. Alma Rodriguez by submitting a completed application form, a brief description of the proposed research experience (if applying for a research scholarship), letter of intention describing leadership capabilities and motivation to be a mentor (if applying for a mentor scholarship) and an up-to-date academic transcript (does not have to be official copy). All WiscAMP scholars are required to attend and present their work in progress at the WiscAMP annual meeting and/or present their work at the academic excellent symposium on campus. A final report will be required at the end of the award term.